This is the former site of the Cedar Grove Beach Club, a collection of cottages mostly built between 1907 and 1924 that was Staten Island's final beach bungalow colony and the city's final beachfront bungalow colony (with a few exceptions, the houses stood in a single line right on the beach). Between 1958 and 1962, all the private property along the waterfront in this area was acquired by the city via eminent domain to make way for a proposed shorefront parkway that never ended up getting built. Most of the buildings on the condemned land were demolished, including, as we've learned, dozens of bungalows in neighboring New Dorp Beach, but the Cedar Grove bungalows were left intact. Having become city property, they were then rented back to the former owners, who continued spending their summers here. 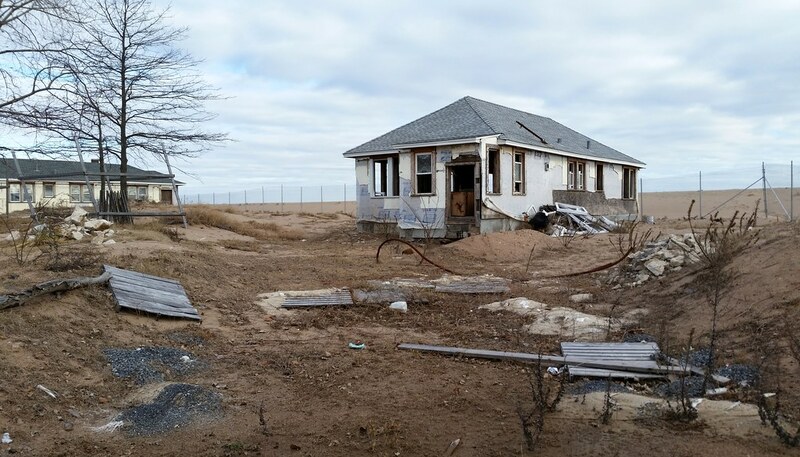 22 of the houses had to be leveled after sustaining heavy damage during a nor'easter in 1992, but the other 42 remained as a seasonal getaway. After the summer of 2010, the city ended its rental agreement with the residents, intending to bulldoze most of the buildings and open up better public access to the beach. The bungalows left standing, as many as seven of them, would be transformed into various park facilities. The two houses you see above are the only ones that ended up being spared (as evidenced by pre-Sandy aerial photos), and it appears that they are now going to be demolished as well because of damage from Hurricane Sandy. So long, Cedar Grove.